Vietnamese cuisine has many different dishes to sample and some of these dishes originated in Hanoi. In Hanoi you can enjoy traditional food in restaurants or road side stalls. Fresh ingredients are normally used which are brought from the market every morning. 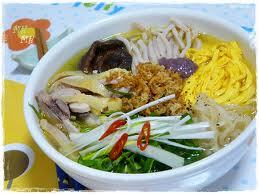 Noodle soup cooked in many different way, there are 5 foods you should not miss when traveling in Ha Noi. 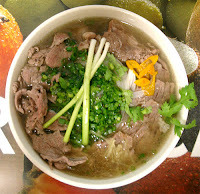 Pho, a typical dish of Hanoi people, has been existing for a long time. Pho is prepered not only in a sophisticated manner but also in the technique which is required to have sweet but pure bouillon, soft but not crasded noodle, soft and sweet smelling meat. Only in cold days, having a hot and sweet smelling bowl of Pho to enjoy would make you experience the complete flavor of the special dish of Hanoi. Dishes made of soft noodle soup are diverse such as vermicelli and fried chopped meat, Bun Thang, vermicelli and sour crab soup, stewed vermicelli and boiled lean meat, etc. The popular dish is vermicelli and sour crab soup whilst Bun Thang is for con-noisseurs, unique and available in Hanoi only. A bowl of Bun Thang includes lean pork paste, thin fried egg, salted shredded shrimp, chicken, onion, shrimps paste, and a little Belostomatid essence. Especially, Bun Thang bouillon made from shrimps and meat must be very sweet and pure. Without enjoying Bun Thang when arriving to Hanoi, it somewhat seems to lack of a part of taste of Hanoi. Bun Cha Hanoi is another great way to use what we have already made (thit nuong, a variation of nem nuong, and picked carrots and daikon). As the name implies, this dish originates from the city of Hanoi in northern Vietnam, but is very popular throughout the country. 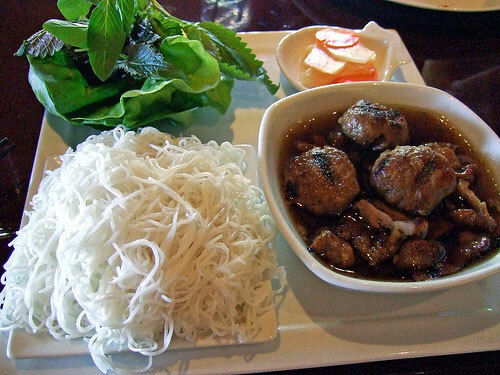 It is similar to Bun Thit Nuong, in that both vermicelli and thit nuong are used, however the difference is that it includes a cha (pork sausage patties) and both grilled meats are soaked in nuoc mam cham, allowing it to soak up all the flavors of the nuoc mam. The cha nuong in this dish is slightly different then nem nuong in that there’s less garlic and sugar and no baking powder, although if you made nem nuong, you can certainly use it to make bun cha Ha noi. 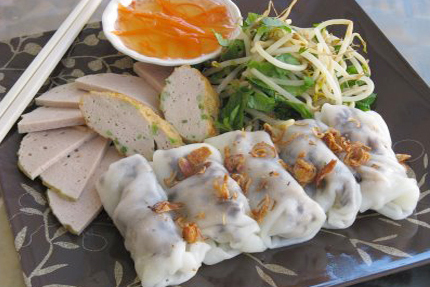 Banh Cuon (Vietnamese Steamed Rice Rolls/Crepes) is the perfect holiday detox food. Banh cuon is a very light crepe often with ground pork, minced wood ear mushroom, and onions and eaten with Vietnamese ham (cha lua), steamed beansprouts, and cucumbers. Another variation arising from a village in Northern Vietnam famous for their banh cuon is called banh cuon “Thanh Tri” a style where the crepe is not rolled but kept in sheets without any filling, and sprinkled with fried onions. 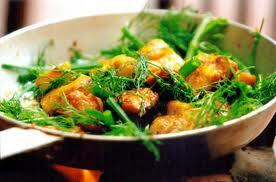 One of Hanoi's most famous specialties is Cha Ca La Vong (La Vong grilled fish pies). The dish was invented by Doan family and has quickly become so popular that the name of the street where it is served was changed into Cha Ca (fish pie) from its former name Hang Son (Paint Street). To have tasty pie, the fish selected is Hemibagrus with solid fresh, less bones and good scent. Fish bones are left away to keep fish meat only, then seasoned with fish sauce, pepper, saffron and galingale. After that, the processed fish is grilled by coal heat and turned upside down to make both sides baked. When serving, an oven of coal is needed to keep Cha Ca always hot. It is served with rice vermicelli, dried pancakes, roasted peanuts, sliced onion leaves, basil and shrimp paste with lemon and chilly.Hanoians often eat this dish while sipping some alcohol in the cold weather. If you are in Hanoi, you should come and explore the grilled fish pie yourself. Posted in: Ha Noi tour,traditional food in Ha Noi,typical food in Viet Nam,Viet nam food.